Blog: Birds In Mud – Page 2 – Lisa G. Buckley, Ph.D.
It’s been a while since I’ve dusted off the Blog: it’s been a stressful time for the Strange Woman, and while Tolkien made the apt observation that harrowing tales make the best stories (The Hobbit), I’m bored of thinking about it, and would much rather talk about paleontology! Our research group had a fun time publishing on my favorite subject: BIRDS! 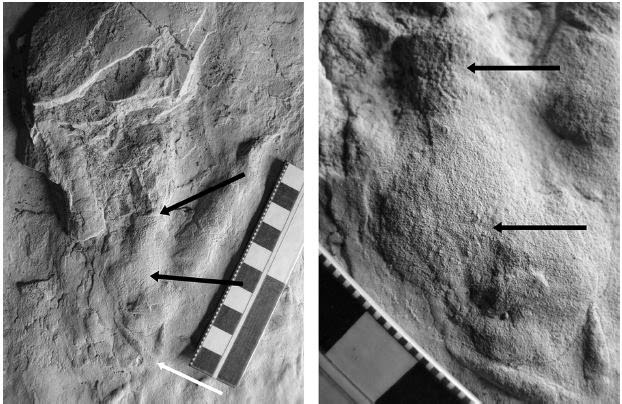 Specifically, we have a recent paper in Cretaceous Research on a new avian ichnotaxon (footprint type) from the Peace Region of British Columbia! Please join me in welcoming Paxavipes (Peace bird footprint, in reference to the Peace Region) babcockensis (in reference to Mount Babcock, the mountain on which the specimen was discovered) to the ichnological family! OK, that’s not taxonomically accurate, as Paxavipes is also part of a new ichnofamily. Bear with me. Bird tracks have been known from British Columbia, and specifically the Peace Region, since their scientific debut in 1981 with Aquatilavipes swiboldae (Currie, 1981). This specimen was recovered as part of the salvage and study operation performed by the then Provincial Museum of Alberta before the completion of the Peace Canyon hydroelectric dam. The area was so well-known for its palaeontological heritage that it was officially designated a Provincial Historic Resource in the 1930s. Today you would need gills and fins (and a whole bunch of de-silting equipment) to see these localities, as they are now underneath what is known as Dinosaur Lake. The type slab for Aquatilavipes swiboldae now resides in the Royal Tyrrell Museum of Palaeontology (RTMP). At the time of its scientific write-up, it was the earliest known bird track type, being from Gething Formation deposits that are Lower Cretaceous (Aptian, approximately 125 – 113 million years old). Since then, no bird footprints have been published on from British Columbia…until now. Fig. 2 of PRPRC 2005.001.015 from Buckley and McCrea (2009). It’s easy to see which part of the slab was exposed for lichen colonization. …but carefully. Lichen is a resistant organism – what else can you expect when fungi and cyanobacteria form an alliance (symbiotic relationship)? Mechanically scraping off the lichen was not an option, as that would have risked mechanically scraping the track surface and the prints it preserved. After trying out a few different chemicals, we saw that a dilute bleach solution effective at breaking down the lichen to a point where it could be gently brushed away with a soft toothbrush. The technique worked so well that it became the topic of my first first-author publication (Buckley and McCrea, 2009). Once the lichen was removed, the surface was revealed…and what a reveal! A grand total of 72 bird footprints were visible, which enabled us to make out five trackways – series of footprints made by one bird walking from Point A to B. Single footprints are like an isolated bone or tooth – they give us good information, but not as much as a whole skeleton does. Trackways are like the whole skeleton. Fig. 4 from Buckley and McCrea (2009) So many bird footprints were visible once the lichen was removed! Fig. 6 from McCrea et al. (2015). Skin impressions such as these give us a good idea of what the soles of dinosaurs’ feet looked like. These tubercles likely acted like the treads on our running shoes. Back to the birds. Since we have trackways, we could tell left footprints from right footprints, but not easily. There was something odd with these particular bird footprints. The usual case for bird footprints is that the outer toe is much more splayed away from the middle toe than is the inner toe (or the toes have a roughly equal amount of splay). These footprints were strange in that the inner toe was more splayed than the outer toe. It wasn’t just one or two footprints out the 72: it was the majority of the prints. Fig. 4 from McCrea et al. 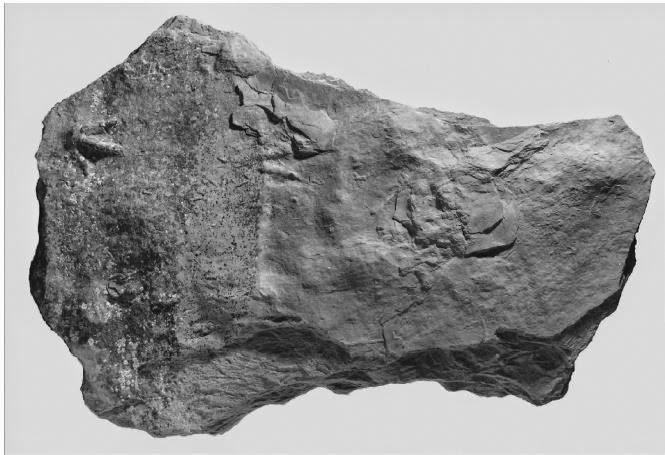 (2015) showing the holotype trackway – see the wider splay between the inner digits? Something was up. There is a bit of natural side-to-side wiggle potential in bird toes, and modern bird footprints can show a big differences in toe splay (70 degrees to 140 degrees between the outer digits), but a consistently larger splay between the inner (digit II) toe and the middle (digit III) toe is not common in Cretaceous avian bird footprints. The only other bird footprint type that shows this toe arrangement is Barrosopus slobodai (Coria et al. 2002) from the Late Cretaceous of Argentina. 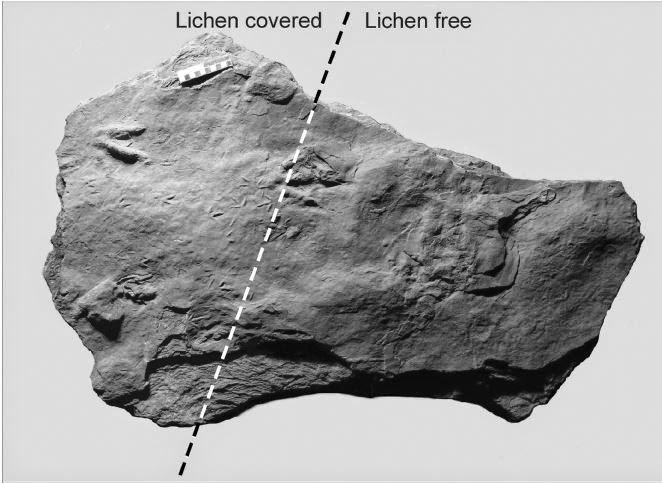 Because these two footprint types are unique when compared to all other Mesozoic bird footprints (but different enough to still be considered separate footprint types), we formed a new ichno (footprint) family of bird prints called the Paxavipedidae. Any new three-toed bird footprint (no hallux) with consistently wider splay between digits II and II than between digits III and IV and thick digits can be assigned to this new footprint family. As an ichnologist, when I see a repeated footprint shape or toe arrangement within all that natural variation, I begin to think about the shape of the foot. Specifically, I think about the features of the skeleton that made that footprint shape possible. Looking at modern birds, Paxavipes and Barrosopus prints are very close in shape to footprints of the Killdeer (Charadrius vociferus). I love this image by Ryan Hodnett, found on Wikipedia. 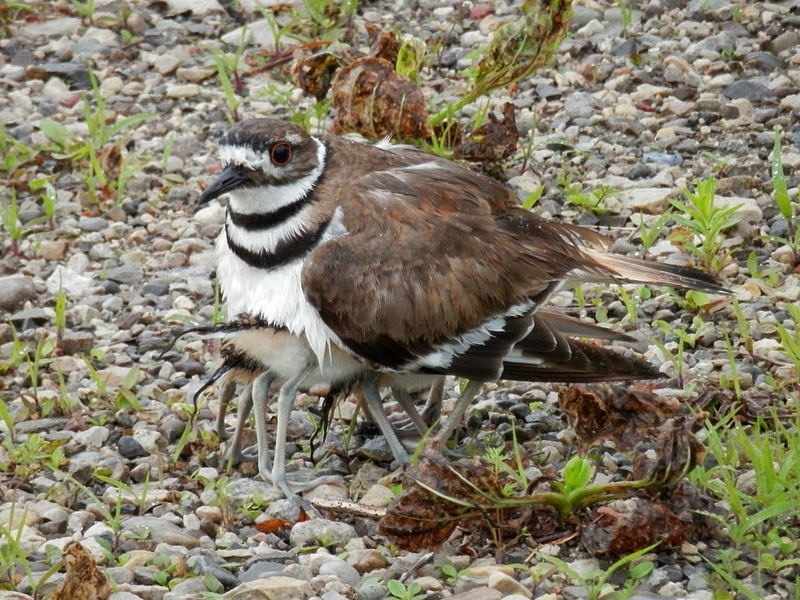 No, Killdeer are not some strange Octo-Bird: those are young Killdeer hiding under the parent. Next time you are walking along a beach and see little brown and white shorebirds skittering along the edge of the water looking for yummy invertebrates, think about a Cretaceous shoreline: you would likely notice the dinosaurs first, but the small shorebirds still made quite an impression! Buckley LG, McCrea RT. 2009. The sodium hypochlorite solution for the removal of lichen from vertebrate track surfaces. Ichnos 16(3):230-234. Formation (Late Cretaceous), Neuqu en, Argentina. Ameghiniana 39(4):453-463. Currie PJ. 1981. Bird footprints from the Gething Formation (Aptian, Lower Cretaceous) of northeastern British Columbia, Canada. Journal of Vertebrate Paleontology 1(3-4):257-264. McCrea RT, Buckley LG, Plint AG, Lockley MG, Matthews NA, Noble TA, Xing L, Krawetz J. 2015. Vertebrate ichnites from the Boulder Creek Formation (Lower Cretaceous: middle to ?upper Albian) of northeastern British Columbia, with a description of a new avian ichnotaxon, Paxavipes babcockensis ichnogen. et isp. nov. Cretaceous Research 55:1-18. The “Birds In Mud” Blog Has Migrated! I’m going to start the process of migrating (Get it? Migrating? I’ll see myself out) my Blogspot “Strange Woman Standing in Mud, Looking at Birds” site over to my shiny new professional site here! Stay tuned for future posts! I am a vertebrate paleontologist who specializes in research and conservation of Cretaceous-age footprints of dinosaurs, birds, and other extinct life. 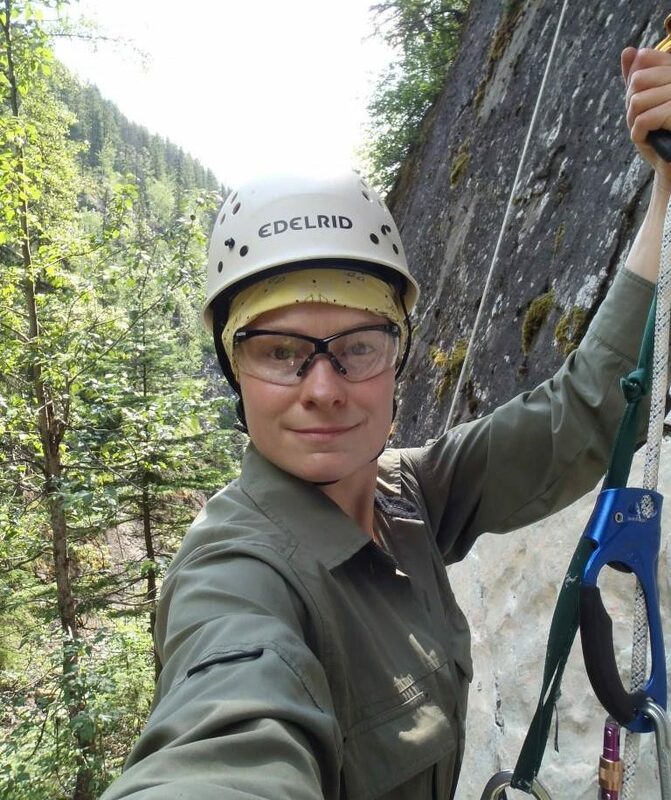 I have over a decade’s worth of experience in principal field investigations, research and survey management, fossil heritage conservation and curation, and public engagement.